Instrumental Rock Music, Manchester, England. 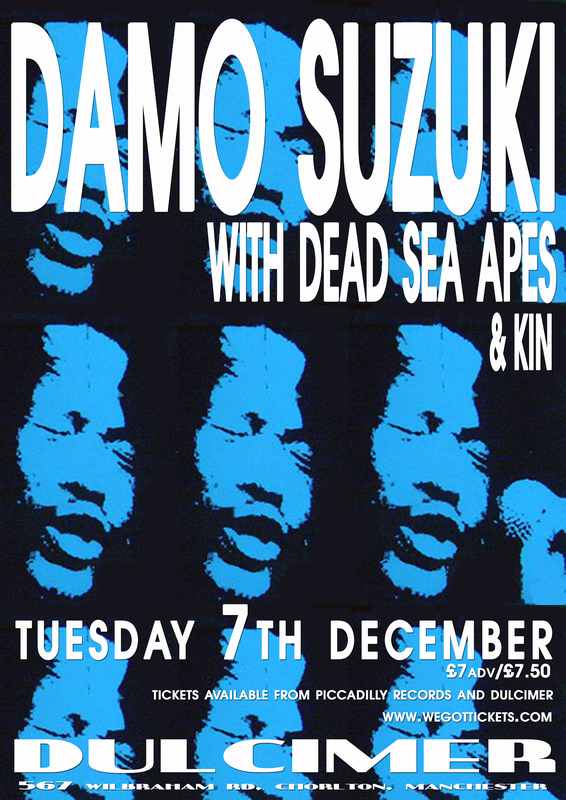 Exciting news: we will be playing a gig with the legendary DAMO SUZUKI on 7th of December at Dulcimer in Chorlton. Damo was the vocalist for CAN in the early 1970s, appearing on their classic albums Soundtracks, Ege Bamyasi, Tago Mago and Future Days. In more recent years he has embarked on a “never-ending tour” in which he travels the world, improvising (or ‘instant composing’ as he prefers to call it) with local musicians or ‘sound carriers’. So we are honoured to be Damo’s sound carriers for this gig. Also appearing will be Manchester-based singer/guitarist Kin with her band. It will be an excellent night. Tickets are on sale online at WeGotTickets and over the counter at Piccadilly Records, Dulcimer and Wowie Zowie. The venue has quite a limited capacity so advance purchase is advised. A thousand thank you’s to Fabio Lugaro for his wonderful photo of Damo, which he very kindly allowed us to use for the poster. Have a look at some of his other fine photography here.